Arkansas Sen. Tom Cotton faced a combative group of constituents at a town hall on Monday, taking heat from a room of people voicing their frustrations with what has been an eventful start to President Donald Trump's presidency. The room erupted in boos when Cotton, flanked by Arkansas Rep. French Hill, repeated Trump's defense that the president will not release his taxes while under IRS audit. "I'm wondering if you'll take the initiative to have him release those returns so we can see what kinds of connections he has with different countries around the world," one attendee asked. 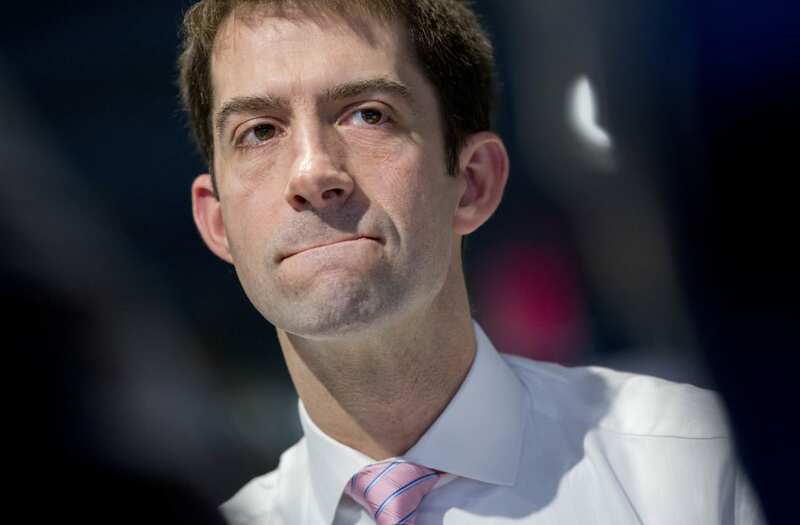 "As far as I'm aware, the president said he's still under audit," Cotton said to jeers. "It doesn't take a lot of effort to find out where Donald Trump has connections overseas, he normally has his names on buildings," Cotton added. Republicans across the country have returned home this year to face town halls filled with Trump opponents eager to give members of Congress an earful. At one point during Monday's town hall in Little Rock the crowd erupted into a "lock him up chant" when discussing Trump's foreign policy. One questioner referred to Congressional Republicans as "you two kindergarten kids up there." Cotton is no stranger to rowdy town halls with constituents. He faced a similarly tough crowd in February as Republicans were crafting legislation to repeal the Affordable Care Act. At the time, Trump tweeted that the outrage has been "planned out by liberal activists."